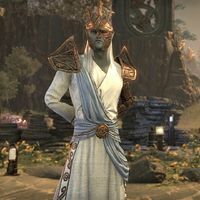 In 2019, Leamon Tuttle took up the mantle of Loremaster for The Elder Scrolls Online. In the wake of the announcement, UESP looked for questions to ask the new loremaster about his work with the game. The interview took place in March 2019, and Leamon's responses can be read below. I was pretty apprehensive about taking on a challenge like this. As you all know, TES lore is incredibly dense, and the prospect of making some kind of egregious error is pretty scary. People really care about this stuff. And any time you're caring for something people treasure, there's the fear that you'll end up killing it, you know? It's like taking care of someone’s cat while they're out of town. You don't want it to die on your watch. I don't want to kill the cat. Lawrence also told me — told all of us, really — to use a light touch. I think all of us have an inherent desire to kind of set things in stone. We want a firm foundation to build on. But part of the genius of Elder Scrolls is its ambiguity. As the Loremaster, he had ample opportunity to force his authorial will on the material, but he didn't. He urged us all to give the lore some breathing room — to keep things open to interpretation. It's very good advice, and I plan on following it! Also, yes, I have a fez on my desk right now. I don't think I've developed the regal bearing to wear it yet, though. I majored in History and Philosophy in college. (Don't ever let anyone tell you a degree in the humanities is useless!) After that, I went to art school. I actually entered the industry with the intention of getting into game art, but found out I loved the content end of things and wound up in the writing department instead. Great question. Writing for games is a lot different from writing standard prose. We have to really focus on things like brevity, clarity, and accommodating player activity. When I started, I wanted to write these grand soliloquies and stuff. But as our Creative Director, Rich Lambert, is often quick to point out, this is a game. At some point, people want to go out and kick the hell out of ogres. I think that's the central tension in writing for games. How do you balance a fast-paced, action-oriented experience with delivering compelling narrative? The secret seems to be a lot of iteration and honest critique from a lot of different people. When I get too wordy, our team of leads and producers are always there to reel me back in. If we can get the balance between player-activity and narrative delivery right, it's going to produce compelling content. Well, I've only been on the job for a couple weeks, so I'm still kind of figuring that out! As a Senior Writer, I spent a lot of time on quests and characters — the meat and potatoes. As Loremaster, I'm operating at more of a bird's eye level. I'm coordinating with various designers to ensure the stuff they're working on is lore-consistent. I'm writing a lot of documentation for potential future releases. I also coordinate with the art department a lot more — naming assets, providing input on architecture, etc. There's a lot to do! Like I said before, I'm still sort of feeling the Loremaster routine out, but for the most part, workdays totally depends on where we are in our development cycle. When we're first developing a zone, I might spend all day writing documentation and reviewing pitches developed by our content designers. As the zone starts to take shape, I might work on dialogue for merchants or write some lore books. Once the development cycle is in high-gear, I'll probably spend a lot of time reviewing quests for lore-consistency or working with the Crown Store team as they develop new assets. That's one of the best things about the job. There's no such thing as a typical day. It's always different, and that keeps things fresh. A lot of it is just knowing your teammates. We have a great team of writers and designers, and all of us have distinctive styles, priorities, and narrative sensibilities. Luckily, we sit together in the office and have a solid rapport. No one really "owns" any of our characters, but we definitely have favorites, and there's always a desire to protect your babies. Our Lead Writer, Bill Slavicsek, always writes for Naryu and Darien, for instance, but Razum-dar — one of our most popular characters — has several parents. Characters like Jakarn, the Vanos twins, Velsa, Neramo, The Duke of Crows, Sheogorath, Vimy Lacroix, and Captain Jimila have all been written by multiple designers. If we have a question about someone else's character, we have a conversation about it. We might also encourage the other writer to run through the quest and make suggestions on how to make the dialogue more consistent with previous content. Ultimately, it comes down to trust and the knowledge that all of us understand the Elder Scrolls style and want to make the best content possible. Time management, without a doubt. Deadlines in game development can easily sneak up on you, and given how interdependent our various departments are, if one person slips, others are inevitably affected. It's one thing to deliver solid content, it's another to deliver solid content on-time. We also have to develop flexibility. Sometimes content you really adore is not well-received, or something you worked on has to be cut for one reason or another. Being humble enough and self-aware enough to accept those kinds of decisions can be tough sometimes, but ninety-nine times out of a hundred, cutting or reorganizing the content is the right call. Our leads and producers are pretty sharp. The most important thing a potential game-writer can do is write. Write early and often, and accept critique gracefully. Nothing happens in a vacuum in game development — everyone will weigh in on your work and suggest changes. Sometimes you'll disagree, but being open to alternative perspectives and viewing your work objectively is really, really important. The second most important thing you can do is read. And don't just read fantasy! The arch-enemy of compelling fantasy is trope, and restricting yourself to a single genre will make breaking out of those tropes much more difficult. Read non-fiction! Biographies, histories, philosophy books, news articles, etc. Making the world feel real and authentic is critical, and I strongly believe that the best way to present an authentic world is to read about the one we actually live in. Third, play games! Familiarize yourself with current trends, and try to get a handle on what challenges a developer might face in designing content for the games you love. Again, writing for games isn't like writing a novel. Certain limitations on how you can deliver narrative are kind of baked into the cake. Learning to work within those limitations (and even turn them to your benefit) is a really critical skill. So, I'll tell you all a deep, dark secret: I'm actually not much of a fantasy guy. Spit-take, right? Now, I've played D&D since I was like seven years old, and I've read the seminal works like LOTR, etc. I've also played a lot of fantasy videogames (like the TES titles, obviously). But if I'm being honest, I rarely look to works of fantasy for inspiration. Like I said before, I majored in History and Philosophy in college, so I spent a lot of time reading about things like Greek, Roman, and East-Asian history, existential philosophy, aesthetics, and metaphysics … like a NERD. I draw from that stuff all the time. Honestly, this is part of the reason I love the Elder Scrolls so much. There's a place for all of those topics in our lore — especially when you really start digging. The fact that we can explore the politics of ancient empires, and Dragons that can argue people to death, and otherworldy beings that challenge traditional conceptions of morality, and divine cyborgs discussing hard determinism, is a testament to how broad and fascinating the lore of Tamriel can be. Ugh! You're putting me on the spot! There's so much great stuff. I'll cheat and give you my top three (in no particular order). First, I love lore surrounding the Alessian Slave Rebellion — particularly lore about Pelinal Whitestrake. I think it goes back to me being a Hellenophile. There's something very Greek about Pelinal. He's totally this Achilles-like figure who is deeply flawed and kind of terrifying. But you've got to respect his dedication to the art of being a murderous, rampaging force of nature. Then there's the obvious one: Tribunal lore. I love Almsivi for many of the same reasons I love Pelinal — insane power combined with deep flaws. The Tribunal also allows us to really stretch the limitations of the genre. The 36 Lessons (which I adore) invite all of us to step out of our comfort zone and explore the boundaries of faith and fiction in a way that few other books do. Not surprisingly, my favorite of the Three is Seht. When I got the opportunity to write for him, I was totally star struck. It was like writing a script for Denzel Washington or Daniel Day-Lewis or something. Hopefully we'll get more opportunities to hang out with them eventually. Lastly, I love Argonian lore. They're so weird! The Saxhleel give us another opportunity to turn fantasy tropes on their heads and show what a truly alien culture might look like. Their investment in the idea of impermanence clashes so violently with our traditional, western assumptions about what makes an advanced civilization, you can't help but wonder if we’ve got things all wrong. I think it's got to be Clockwork City. I loved the subject matter, loved the characters we created, and the synergy between the content designers, the artists, and the writers felt very strong. That sense of collaboration and camaraderie made crafting the narrative for the zone really fun and rewarding. Honestly, Clockwork is a perfect example of how AAA game-development is a team sport. A lot of people credit me with developing Sotha Sil, but his character was absolutely a team effort. When I wasn't hammering away on zany, esoteric lore books, Senior Content-Designer, Andrew Young, and I were spending hours in conference rooms discussing Seht's motivations, his relationship with the rest of the Tribunal, etc. I feel like Andrew and I are kind of Seht's mom and dad. I don't know which of us is which, but it was absolutely a collaboration. And that's the point; more often than not, solid collaboration determines the quality of the final product. In Clockwork, everyone — from the writers, to the artists, to the content designers and beyond — was rowing in the same direction, and I'm really proud of what we created. To be honest, I don't think I could improve on the content of previous TES titles. They're all labors of love that could only have been written by the designers that worked on them. That said, there are definitely quests I would have loved to watch develop. Being there at the ground floor during the creation of Arena would have been amazing. It was still the Wild West back then, and most of the processes, tech, and development strategies we take for granted now didn't even exist yet. Luckily, a lot of the old guard are still killin' it here in the Zenimax family, so I can learn about a lot of this stuff second-hand. I would have loved to be a fly on the wall during the development of Morrowind, too. The raw creativity and guts required to create a world that foreign is something we don't see very often anymore. Sotha Sil will always be near and dear to my heart, but that's kind of cheating since I spent so much time with him. I love Paarthurnax. The idea that he's constantly struggling against this primal need to conquer and dominate is a great hook, and his dialogue and mannerisms are really distinctive. I think Almalexia is fascinating. There's a tremendous amount of depth to her character that people have a tendency to gloss over. I'm a huge fan of the Princes, particularly Hermaeus Mora and Mehrunes Dagon. Other NPCs I dig include: The Gray Fox, Delphine, Serana, and Barbas. I would love to go to Yokuda, during the golden age of the Ansei. Warring fiefdoms battling for dominance, sword-singing, high drama and poetry, etc. It's like a kickass Kurosawa epic. All that being said, we don’t have any plans to explore Yokuda any time soon. It takes some imagination, but yeah, I'm pretty good at it. People here laugh at me sometimes because I'm constantly urging them to remove vowels. Insanely difficult words make things a little tougher on our actors, though, so we try not to force that sort of thing on them too often. Their job is hard enough! I'd love to. It really depends on demand. The community folks and I are already examining options, though. Not consciously, no. I've had my head in TES lore for a long time, and my theories are pretty much locked down at this point. But this kind of leads into the points Lawrence made in his farewell address. Even as the Loremaster, my personal theories and perspectives on the lore are not authoritative. Good lore should allow ample room for interpretation and debate. If I write something that brooks no opposition and comes off as totally irrefutable, I think I've failed as a writer. What I find really miraculous is how people can take a piece of text that I've written and find something in it that I never even considered. I’m a firm believer in the idea that art exists on its own, separate from the artist. The intentions of the writer — while potentially interesting — are ultimately kind of irrelevant. What matters is the text itself. So, when I see a fan lay out a compelling argument that is A) totally consistent with existing lore and the text itself, and B) completely at odds with my own thoughts of the subject, it's an amazing feeling. Every answer we provide should prompt more questions. Questions lead to contemplation and debate. Keeping that excitement and exploration going is basically the whole reason we do this stuff! We don't have any plans for the Tribunal right now, but watching Almsivi interact as a family unit would be really fascinating. I know people are particularly interested in getting more face-time with Ayem at some point. If the success of our recent titles is any indication, the world of the Elder Scrolls will be around for a long, long time. So, there's no telling what the future might bring!